WHY WHALES STRAND: is the seaquake stranding solution flawed as some scientists claim? is the seaquake stranding solution flawed as some scientists claim? Some scientists are reporting that a big seaquake on 30 August 2012 near Jan Mayen Island caused the pilot whales to beach in Scotland. They were mistaken. The quake that caused the beachings occurred on 11 August 2012 along the Northern Mid-Atlantic Ridge. You can read my full report on the stranding at this (link). This page will try to limit the damage these misinform scientists have done to the seaquake stranding solution. The scientists said the August 30 quake was responsible. They did not elaborate. The only possible basis of their claim is that hydroacoustic pressure changes generated by natural seafloor upheavals (known scientifically as T-Phase Waves) can and do enter the deep sound channel and travel for thousands of miles with little energy loss. What the scientists likely suspected was that the 6.7 magnitude quake generated a series of T-Phase Waves that traveled in the deep sound channel at 1,500 miles per hour and caught up with the pod on a feeding dive somewhere near where they beached. It is theoretical possible that a strong quake can generate seismo-acoustic energy that could travel a great distance and d\still injure whales. However, they must not be any land masses between the seismic source and the area where the injury takes place. On for the 30 August event, there was a huge pile of rock (Jan Mayen Island) situated between the quake's location and the area offshore where the pod would have been feeding. This very close island mass bounced the T-waves in all directions except in the direction needed to injure the whales located offshore of the stranding beach. This was why I ruled out this big quake long before I decided on the 11 August 2012 event on the Northern Mid-Atlantic Ridge south of Iceland. Furthermore, if this big quake emitted whale-detectable precursor signals a few hours before the main event, any nearby cetaceans would have run from the area long before the quake occurred. This was the same mistake made by scientists from New Zealand who said that if a magnitude 8 quake could not produce a stranding, it was impossible for mag >4.7 to <6.7 event to cause beachings? These scientists failed to consider precursors. Major quakes never injure whales because these events always emit detectable signals weeks before the main event whereas many of the lesser magnitude events emit no warnings whatsoever. Having flourished for 55 million years in the seismically active oceans, cetaceans have evolved a means to detect the most dangerous events weeks in advance. Sorting out how they do it is now my major focus. I am hoping that they can teaches us their secrets and we can apply the same to saving millions of human lives. One stranding experts did suggest that earthquakes and whales have been co-existing for 50 million years so surely evolution has already shored up the whale's sinuses and middle ears so that they can now withstand even a magnitude 9 earthquake. This expert never put an ounce of thought to his comments, yet pretends to be the authority on all things whale. There's no doubt... without the help of evolution, toothed whales would never have survived as a species in seismically-active waters. But scientists are wrong to suggest that evolution would fix it so that whales could endure seaquakes of all intensities. Evolution is NEVER perfect. Furthermore, evolution often takes many false turns and runs in a brick wall. And, evolution never backs up--it just moves off in a different direction leaving difficult clues to follow. Whale scientists have no understanding of the direction that evolution took trying to protect whales from sudden pressure changes generated during natural seabed upheavals. The reason they don't know is because they never study the topic. Had they properly evaluated my work over the last 51 years, they would have realized that I solved the centuries-old mass stranding mystery decades ago. Here's something else scientists never considered. Two hundred years ago, the oceans were teeming with whales and with massive schools of surface fish. In fact, they were so many whales that they could easily overgraze on the squid in a particular area and be forced to relocate to a new feeding grounds. Seaquakes might have prevented this overgrazing on the breeding stock by removing a pod or two every month or so. Thus, evolution had no desire 200 years ago to seaquake-proof whales. Because seaquake-injured pods can not dive and feed themselves, their recovery depended on finding food on the surface... a relatively easy task 200 years ago due to the massive amounts of schooling fish on the surface. The seaquake-injured pods would swim downstream with the current, grabbing an occasional meal along the way, and slowly recovering from their injuries. Since their biosonar was knocked out during the time they were on the surface, they would have had no acoustic memory of the seafloor to guide them back from where they came. They would have been forced to find a new feeding grounds. Thus, seaquakes served evolution by preventing overpopulation of certain areas and by spreading the species around to new territory. However, overfishing by large surface trawlers has removed ~90 percent of the surface fish (low hanging fruit) which now makes it nearly impossible for today's injured pods to find enough substance on the surface so they can recover. As a result, far more pods are beaching now with fewer and fewer individuals in each pod. The trend is clear and threatens the destruction of the species from seaquakes alone. In other words, we might not be able to stop the decline of our pelagic toothed whales and dolphins even if we stopped the US Navy and the oil industry from killing them. It could already be too late! (1) Humans should never assume that whales are so stupid that they will swim into an area where 5-6 seismic surveys are ongoing or where Navy sonar is operating. Healthy whales move away from loud booming noises, not into them. They will not get so close that noise causes pain or panic. That is unless they are suffering a prior injury induced by an undersea earthquake or volcanic explosions. In every incident in which sonar was shown to have caused injury in whales, there was a prior earthquake upstream. If the quake knocked out their ability to navigate, they would have no idea which way to swim to escape further injury by the sonar or by the seismic survey vessel. In other world, sonar and airguns are injuring whales already injured by undersea upheavals. (2) Airguns can and do injure coastal water species trapped inside a cove where they can't swim to safety. Small explosives used in conjunction with 3D and 4D surveys operate in shallow water where pilot whales never venture unless already injured. Even for coastal water dolphins, the stranding pattern caused by seismic surveys/explosives are stretched out over a few days to a few weeks. Several animals go ashore, then a few more a couple of hours later, and then few more the next day, and so on. Never is there mass beachings caused by seismic surveys. (3) Offshore deep-water toothed whales and dolphins never feed inshore, and are never trapped by seismic survey ships. (4) Many experts ignore the consistent observations at the beach. One scientists said, "stranded cetaceans do not float passively with currents after experiencing some sort of “damage” possibly induced by a quake." My goodness, where did she come up "float passively". The seaquake stranding solution never suggested that whales "float passively" with the surface currents. Water is 800 times denser than air. Swim with your eyes close in a current and within seconds, the resistance to swimming in any direction other than downstream, will turn you and point you headfirst in the path of least drag. Any so-called whale expert that does not understand drag forces while swimming should go back to the 8th 5th grade. This scientists adds, "Instead they swim actively towards the shore often at their normal or even accelerated speed." Now what is an intelligent person suppose to deduce from the observation that they swim towards shore at accelerated speed.? The first thing to pop into my mind is that the whales are lost and have no idea where they are going. The second thing to come to mind is that sharks are not too far behind them. The seaquake stranding solution says that stranded whales are swimming with the flow of the surface currents when they go ashore! Read all about how surface currents guide stranded whales to the beach. This expert claims the seaquake stranding solution is also invalid because dusky dolphins don't strand very often on New Zealand shores. But dusky dolphin mostly live on the eastern shores of South and North Islands. 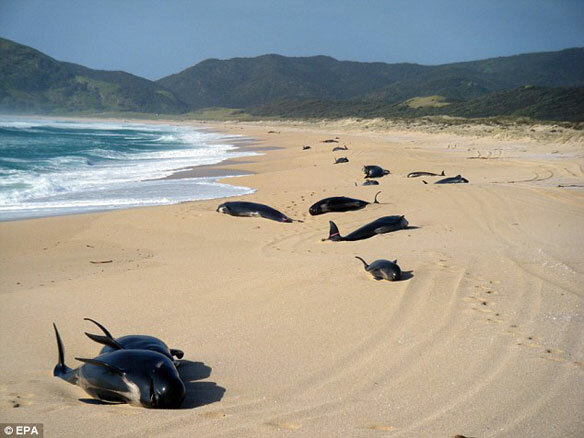 If they were injured by a local quake, the surface currents would guide them east towards the Chatham Islands, 800 km from their habitat. Chatham is the first opportunity seaquake injured dolphins would have to beach themselves (many dusky do strand at Chatham). However, an 800 km swim with the flow of the surface currents would take less than a week. 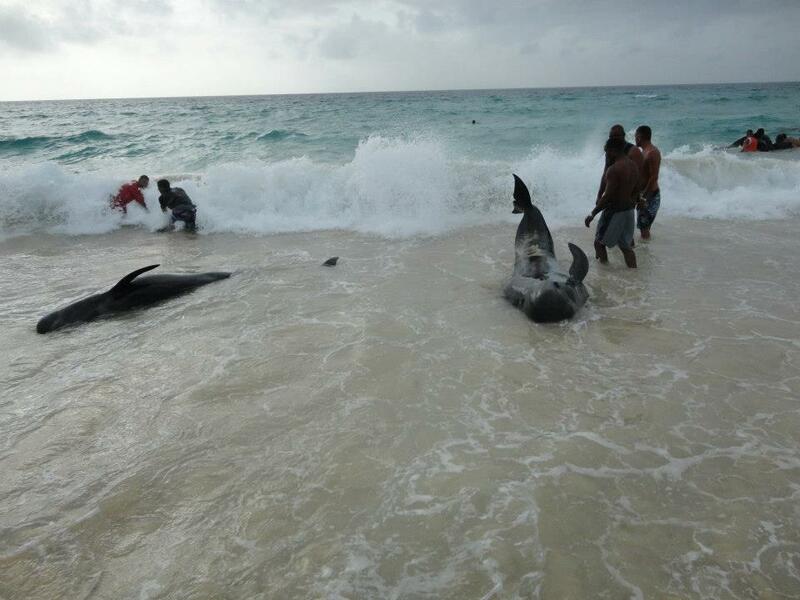 Injured dusky dolphins would be relatively fresh and be able to resist beachings. Most would swim past the Chatham Island and out into the deep ocean where the sharks would harvest them. She also claims that the seaquake stranding solution does not explain why there is less strandings along the Pacific Coast verses the Atlantic Coast of both North and South America, especially since the Pacific Coast is more seismically active than the Atlantic. She adds: "Even California with all its seismic activity has less live strandings compared to the US East Coast." If jealous scientists would take the time to read the seaquake stranding solution before they made stupid comments, they would have known why far more beachings occur on the east coast than on the west. It all has to do with upwelling currents that are exclusive to the Pacific Coast. Coastal upwelling forces cool bottom waters up from the seafloor. This upward flow of water causes surface currents to flow away from the beach. The only time a whale might strand on the Pacific Coast is when the upwelling stops or when strong shoreward winds wash the surface waters ashore, overcoming the forces of the upwelling. Read more about California whale beachings. Here's a startling fact that whales scientists never talk about. WHALES NEVER STRAND WHEN THE BEACH IS CALM! There is a great difference between weather conditions when standings occur and when they never occur. This fact is so obvious! It's very shocking that whales scientists are ignoring what stares them right in the face. 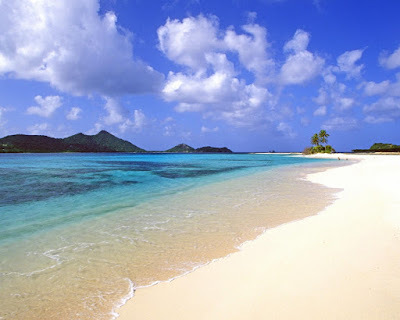 Whales never strand when the beach is like the photo below. Scientists are hiding the truth! They ignore the visual evidence that shows that pods of whales and dolphins go ashore when the surface currents are washing toward the beach and when the tide is incoming. My readers can prove this with their own eyes. The sea conditions below are ideal for beachings. Be assured that the direction of the wind, the inflow of the surface currents, and the incoming tide pick the stranding beach, not the whales. This is the perfect example of biosonar failure in stranded whales. Stare at the picture above. The wind is blowing from the sea toward the beach, and setting up a strong shoreward flow. This is when strandings occur. On the other hand, you will never see a "lost pod" of whales or dolphins swim ashore when the sea is flat calm—the "lost pods" always comes ashore when the wind and surface currents are directed shoreward. The stronger the shoreward flow, the greater is the chance that a "lost pod" will be washed ashore! Look at the following videos and notice the rough seas in the background. (video1) (video2) (video3) (video4) (video5) (video6) (video7) (video8) (video9) (video10) (video11). Of course, it all depends on the wind speed at the time the whales came ashore, not when the camera arrives. Never has a pod of whales been observed beaching itself when the surfaces currents were flowing away from the beach. This easy to check... the only time whales beach in California is when surface currents are flowing towards the beach. Ignorant experts also say that at any given moment there is a quake happening somewhere; thus, it's easy to blame strandings on earthquakes. They are so sadly misinformed. Earthquakes that cause beachings occur only in known whale habitats. If fact, research ongoing at this present time may very well narrow the location of earthquakes dangerous to toothed whales to less than 10 spots around the globe. What we are finding indicates that most quakes injurious to pelagic pods of odontocete occur near hydrothermal vent fields. Maybe this is where the squid hangout? We're getting closer and closer every day to sorting out exactly what happens on the seabed during an undersea earthquake. Please educate yourself. Don't let the scientists fool you any longer! Deafwhale Society, the world's oldest whale conservation group.